Renovations began in April to restore the 31,325 square foot Bay City Times building, with the oldest portion originally dating back to approximately 1910. This adaptive re-use project will convert the old building into 31 residential loft apartments. The project will also include a 2nd story urban infill addition of 3,800 square feet on the southwest side of the site. The loft units vary in size from a 590 square foot one bedroom to a 1,625 square foot three bedroom unit. The project will include conventional apartments, as well as multi-level and townhouse style apartments. The styles of the units vary to reflect the historic components of the existing architecture combined with contemporary design. Many of the units will incorporate historic plaster ceilings with decorative moldings, historic quartered oak-wood paneling with leaded glass cabinet doors. Others units will feature a raw industrial feel with exposed cast in-place concrete beams. 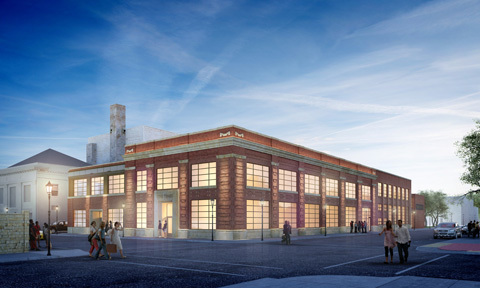 We are working closely with The Neighborhood Development Co. team to turn their vision into reality for the Times Lofts in Bay City, Michigan. The Times Lofts is pursing the Historic Preservation Tax Incentives program. The State Office of Historic Preservation and U.S. Park Service use this program to guide their design review processes for the credit. These standards are a series of concepts about maintaining, repairing, and replacing historic materials, as well as designing new additions or making alterations.